Yet another brilliant visual treatment of Bomba Estéreo's vastly important cross-cultural music. Daily Dose is your daily source for the one song you absolutely, positively need to hear every day. Curated by the Paste Music Team. Bomba Estéreo’s 2016 video for “Soy Yo,” sorta took the world by storm. Currently sitting at over 18 million youtube views, the Latina empowerment visual opus, made a star out of young actress Sarai Gonzalez, whose performance even garnered an invite from President Obama to the White House. 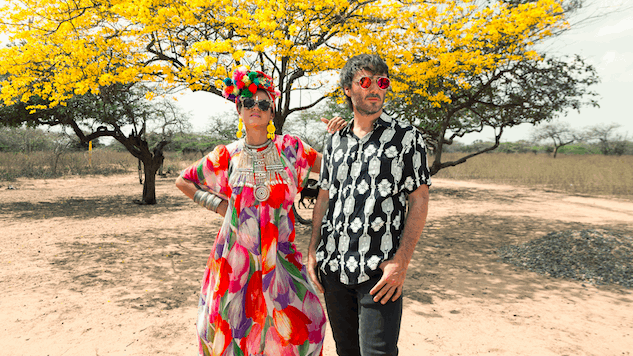 The success of “Soy Yo” certainly says something about the powerful visual aesthetic that Colombian electro-cumbia band Bomba Estéreo understands is an important and enhancing companion to their music. Today, the band released the audio and most notably, the video for their latest single, “Duele.” Directed by Sam Mason, the video sees a woman in a red dress shopping at a produce market in a Latin neighborhood, only to find her lover, hand-in-hand with another woman in a more provocative red dress. Mason takes us into a Dalí-esque emotional desert within the protagonist’s mind, as she processes the pain she feels in the moment that she learns of her partner’s infidelity. All the while, Bomba Estéreo Liliana Saumet’s enchanting voice sings over a mesmerizing flauta de millo-guided beat – the traditional woodwind instrument used in classic cumbia music from the Caribbean coast of Colombia. “Duele” literally translates into “it hurts,” but in the context of Saumet’s vocals, she might as well be saying “pain…pain…pain” and we never feel as if we’ve left the protagonist’s brain achieving an Inception-esque film-making effect. Mason’s use of reds in the video exacerbate the emotions being conveyed and it’s altogether another brilliant visual treatment of Bomba Estéreo’s vastly important cross-cultural music. Watch the video for “Duele” below and check out their US tour dates as well as European shows with Arcade Fire here.